Sometimes an article cannot be completed without a proper quote or quotation from an authentic source. People want the news to be accurate and precise. Therefore, they always count on a reliable source. Stuffing your articles with too many quotations might make your blog posts look lengthy, but you users might feel difficult to scroll too much. How about a jQuery Quote rotator and animator, which would not only make your quotations look remarkable but will also gather all the quotes at one place. In this article, we will show you How to create a jQuery Quote Rotator in Blogger? Blogging is not about earning. Its about serving the Humanity. Don't choose Blogging as your profession, unless you really have no choice!!! The Lift is too short, Live it or be dead. Progress is the product of human agency. Things get better because we make them better. Things go wrong when we get too comfortable, when we fail to take risks or seize opportunities. After adding the above coding, you need to add the following HTML code into the Blogger HTML Editor so that it would help you in creating rotating and animated quotations. You can change the animation transaction depending upon your needs. 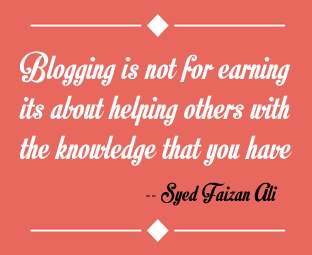 <li data-author="--- Syed Faizan Ali" data-easeout="lightSpeedOut">Blogging is not about earning. Congratulations: Now publish your article and enjoy the magic. The quote would rotate automatically. However, you can skip to the next quote with ease. It would keep on rotating until you move to another webpage. We hope this tutorial has helped you in learning how to create a Jquery quotation Rotator in Blogger. Do let us know what you think about this widget. Share your thoughts and opinions through the comments below. WOW ! Awesome creativity man. Keep it up. You need to add both codes in Blogger Post Editor! This rotate randomly, not that far. well done syed ! keep it up ! Awesome post , but professional bloggers wouldn't use this widget instead they would use the same space for advertisement ! i dont know why. this is not work on my blog. Thanks so much... But why I can't edit margin-botton, add background in CSS? can you please elloborate ?? i cannot understand ??? where to paste the code ?? Wow this is excellent, thanks so much! YOU ARE THE BEST! I LOVE YOUR WORK! Can we add a next and forward button ?? the quotes are odd . .
Could you give us the files for download please?